i just starting to download. and realise that you've done nav 47 before. yaaaay. okay... i know that in japane month is named after the number of the month as in for example: ichigatsu (ist month) nigatsu (2nd month) and soo on. so for the 24th month it'll be nijuushigatsu. 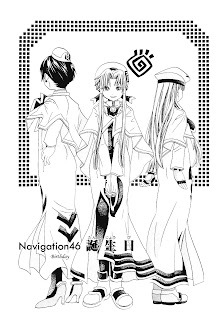 I'm waiting for the publication of the last 4 volumes of Aria in my country (Italy) at the end of the year.... it's a long wait, but in the meantime I read your scans. Good job! Thank you very much this is one of my favourite manga. @anonymous above GrimaH:happy one day late B-day. This is the thing i wait the most in the internet. Thanks and keep up the good work! "okay... i know that in japane month is named after the number of the month as in for example: ichigatsu (ist month) nigatsu (2nd month) and soo on. so for the 24th month it'll be nijuushigatsu. but what about for latin base language? what is a months after december? what is the name for 13th-24th month?.... now thats interesting"
"NOTE: The earliest Latin calendar was a 10-month one, beginning with March; thus, September was the seventh month, October, the eighth, etc. July was originally called Quintilis, meaning fifth; August was originally called Sextilis, meaning sixth." Finally! I've been waiting for this chapter to be translated for a long time, because this could've been clear all the misunderstandings and strangeness of the timeline (because of all that 1 Aqua year is two Manhome years). And it turns out that they're confused with it too! Suddenly all of my theories became true. For me in Italy it's july 29 at present, so yesterday when the Nav. 46 has been added, it was exactly MY birthday, then I have posted my comment some hours after reading it. In Italy the publication of Aria has been stopped for about two years after the first nine volumes: unfortunately it hasn't had a great success. However recently in Italy we have seen the anime dubbed in italian, I think it's the first time that this wonderful anime has been dubbeb. Dubbed? Amazing! I mean it's an expensive task, especially that Aria anime relies a lot on the dedication of voice actors. It must be high quality to work, else it's not worth it. How does it sound, is it a success (the dub)? BTW, was it dubbed in italian or venetian? (The venete language is more spanish than italian, it's often classified as a separate new-latin language. Definitely nobody understands what two gondoliers say to each other while on the job... which is a good thing, because most visitors would be offended. The venete language is full of rude profanities. The citizens were really locked up together in their little city for a millenium, all families knew each other well, probably intermarried, so they wouldn't take offence in such harsh talk. Volume 10 Chapter 46 "Birthday", page 03 and look at the telephone notepad: is Akari really left-handed or did you invert the page for "western" cell order? ^ no she is not lefthanded and the chapter is still the same (not mirrored). There is a notepad on the wall besides the telephone. Akari holds the pencil in her left hand, jotting down the details of an appointment, while holding the phone handpiece in her right hand, in a weird pose. This occurs very early in the new "Birthday" chapter, on the third page. I have seen only few episodes (many thanks to my friend) of the anime because it has passed on satellite-channel and I'm not connected, for this reason I'm waiting for DVD, I'm really patient! However, it was dubbed in italian, I think it has no sense to use the dialect for an anime: no many people can understand it, maybe the accent but not in this case. I haven't listened the voices of all the main characteres, but some friends said the job was quite good. I will see.... for the moment I read ACS realeses and I watch Aria the Origination episodes edited with french sub I've bought in France. One more information: in Italy the anime are always dubbed in DVD realeses, probably for this reason is difficult to find some anime-series. Here are the details of the italian Aria dubbing for the RAISAT Smash Girls channel. Amazing! Wonder what all those male chauvinist gondoliers in Venice think about it? Same for Hungary, subtitles are rare in any movie and almost unheard of on TV. It is suprising, because most countries of the world go for subtitling: less cost and promotes learning foreign languages. Hungarian dubs are traditionally very good for animation, and japanese is quite similar in concept to hungarian language, yet I think Aria would be a difficult target and probably cost a lot to lip-sync it properly. Some terrible news just in: the masonic gondoliers of Venice, in alliance with the british grand lodge, have successfully conspired to pull Aria from the air with a total frontal attack. (No suprise, neither group accepts woman). They managed to destroy the contact between RAI and the Sky Media Group, pulling RAI extra channels from satellite broadcast effective 29th July 2009. There will be a new platform called TivuSat, sometime in the future. Knowing the italian way of things this probably means 2180AD... The Tivu Nigra decoders are not yet available. so in mars people only celebrate birthday once every 2 earth years.. that nothing. my friend only celebrate her birthday once every 4 year. does anybody ever wonder about aria company building?? cuz for me it looks very odd. it's a 3 stories building. the odd thing is that from the back (facing the building) the top most floor is tall (higher roof), hinting there's a room on it.... but from the front (facing the ocean) the top most floor is lower (hinting theres no room on it). There is a 3D CAD file somewhere on the net, which lets you navigate the Aria HQ building via Google Earth. Ground floor is waiting area, 1st floor is office + kitchen and roof area is bath and 2 bedrooms. I think there is also a basement (underwater level), but it is never shown (maybe Caith Sith probably lives there). It would be nice if someone could upload the italian TV dub soundtracks. If one already has the japanese raw, it could be used with VLC to watch it in italian and the download data traffic is much less for just the audio part. So far, I don't think Akari's voice actor was a good choice. I can´t find anything about the 3D CAD file T_T I wanna see Aria Company. anon guy, can you help me with this? If somebody want to listen to the italian voices of Akari, Aika and Alice (and also Aria-sachou 'p-nyu') go to youtube where you can find the special introducing Aria The Natural. Wish I knew Italian! It feels weird listening to an Akari with such a low voice but I like the way it sounds naturally spoken, unlike the Japanese (artifically high, voice-changed etc) or English dub (just jarring in general). Do you actually have an english dub? I remember there was some online petition to have US Aria DVD's with dub, as well as subtitle. I should have made my post clearer. I was comparing the style used in the Italian dubbed Aria to the *general* Japanese and English dub. Wow, the Italian dub is strangely fitting. It sounds like the voice actors had a great time doing it, with all the emoting they pull off. I like it how Akari's voice sounds a bit more mature. And of course.. it's VENICE! It all makes sense now. >Some terrible news just in: the masonic gondoliers of Venice, in alliance with the british grand lodge, have successfully conspired to pull Aria from the air with a total frontal attack. (No suprise, neither group accepts woman). Do you have links to a source for this? It is pretty big news in Italy now and the consumer protection agency is investigating. The gist is: state run television company RAI and prime minister Berlusconi's private TV empire decided to unite forces against the SkyItalia television group, which belongs to the british Murdoch media empire. RAISat has withdrawn its pay-to-view channels from the SkyItalia satellite platform, summarily ending a many years' old partnership. Supposedly SkyItalia offered only 400 million euros to RAI for 5 years and that was not enough. RAI and Berlusconi will start a new TivuSat platform together, which uses a different pay-to-view decoder technology. This move cuts access for several tens of thousands of italian households. A new Negra3 set-top box may cost 150 euros per household. This chapter hasn't an anime-episode but I think that some ideas and images have been used in the episode "Those Orange Days..." or somewhere else (for instance page number 22). Is it so? Thank you Inthernet for the information: Amanchu vol 1 cover is really great, as aspected from Amano Sensei. In which western country will we see it first? Comiket 77 is nearing and I wonder if anyone will be able to speak with Yuuta at the convent? I tried to e-mail him about online sales for the full Aria gondola racing game, but no answer so far. Look at this, look at the top, Hikari and Ooki doing open water scuba in colour. Alicia's new job. After retiring from gondolier business, Alicia still could not forget about the sea, plus she needed lots of money to feed her family. Alicia eventually became a wiking mercenary, who plunders Neo-Adriatic islands for fun and profit. If you want to link stuff, blogspot unfortunately uses html. yes yes, we're already aware of that, please check the status at the bottom of the page next time. a big THANK YOU to ACS for this chapter and all others! If you're looking for the covers and content pages, you can just get the volume raws from the mediafire - but we have no plans on translating the 4komas/author pages for volume 6 and below. Hello! This month's National Geographic Magazine is about Venice, problems with tourism and acqua alta. The magazine cover says Yellowstone, but there is Venice content inside. Much of it is also available on the NGC website for free, which is truly very nice of them! If anyone has the italian dub version, please rip the audio track from them and upload somewhere. I downloaded an entire episode but can't stand the silly bright Smash logo in the upper corner. It would nice to watch the clean raw with italian audio track overlay (thanks to VLC developers). I love this series very much. Thanks for your hard work, really.